Well, I did it! 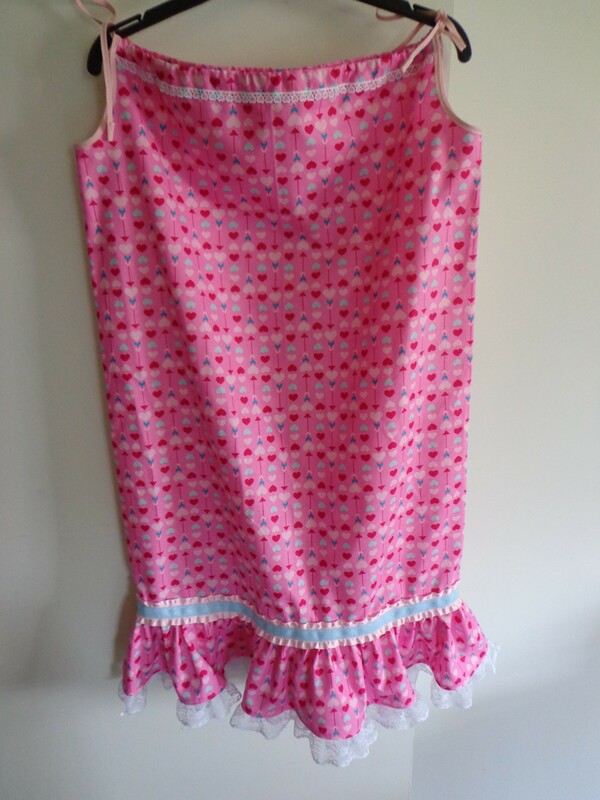 This year for Lent instead of giving something up I decided that I was going to sew at least one dress a week in order to help clothe God’s children. I wanted the little girls to put on the dresses and feel like a princess. The dresses that I make with the ruffles take longer to sew together due to having to gather the ruffle and all the fun that goes along with that. It seems like with every new dress I have a new favorite dress that I’ve sewn. This one fits that bill. When I was finished I felt like it was a beautifully classy dress, almost like a Blue Willow dish. I used an embroidered eyelet lace around the hem, a white embossed ribbon around the ruffle, and then an embroidered eyelet trim at the top. I found some pretty, sparkly blue ribbon that matched the blue hearts and then I had some heart lace trim that I used along the neckline. The ribbon is my favorite part of this one. The other ladies in the Dresses for Missions ministry manage to sew a lot of dresses, but trimming is always the last step. To help them out I will sometimes take a group of the dresses to finish them. I add the binding around the arms, turn the tops down to make the pockets for the ties, and then add the ties. I was also asked if I had lace at home for the dresses, so I guess that they also wanted me to lace them up a bit. 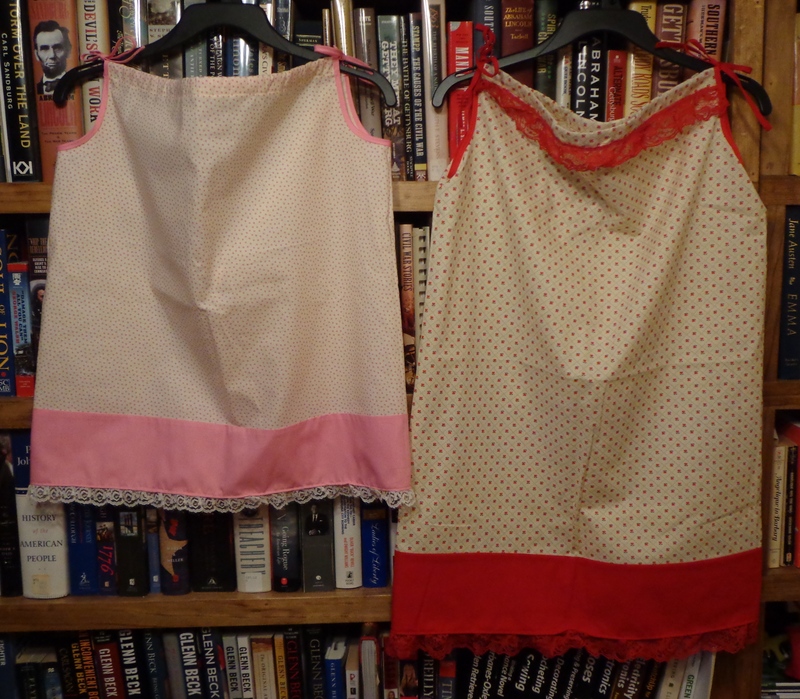 I treated these ones a lot like the pillowcases that I use; I added lace on the bottom and if I felt like it needed it I would add some at the neckline. It took me almost every free moment that I had between Sunday and Wednesday to do these, but I had them done to turn them in a week after I brought them home. Some of these dresses were darling! The dress on the left had some really bright stars on the fabric so I used bright green for the arms and bright yellow for the ties. Then the lace at the bottom was a nice pink that matched the background of the top part. These two were made exactly the same, so I took great pleasure in making them different. 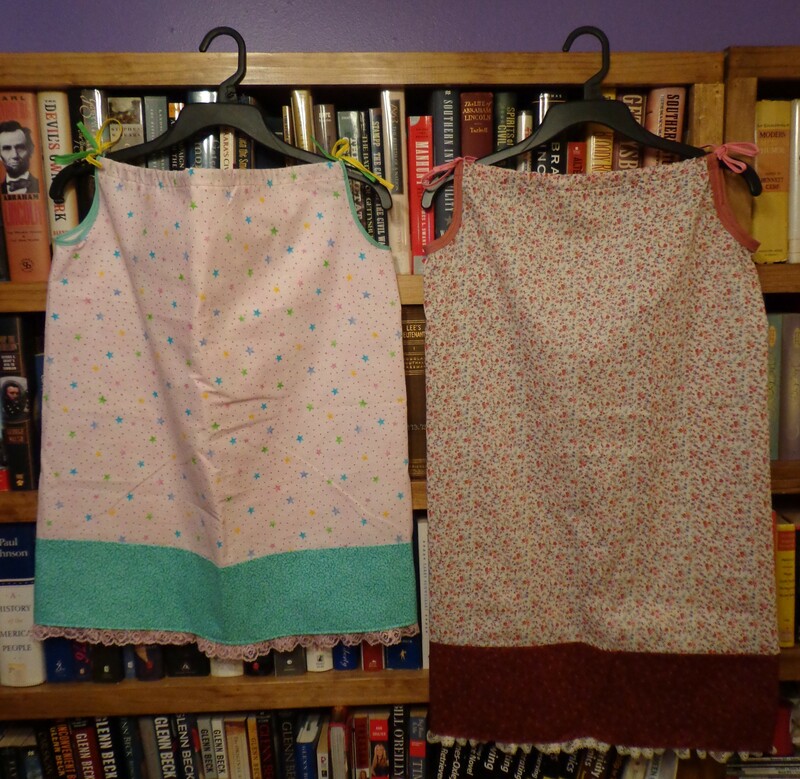 The dress on the left was trimmed in brown and I used a brown lace on the bottom. 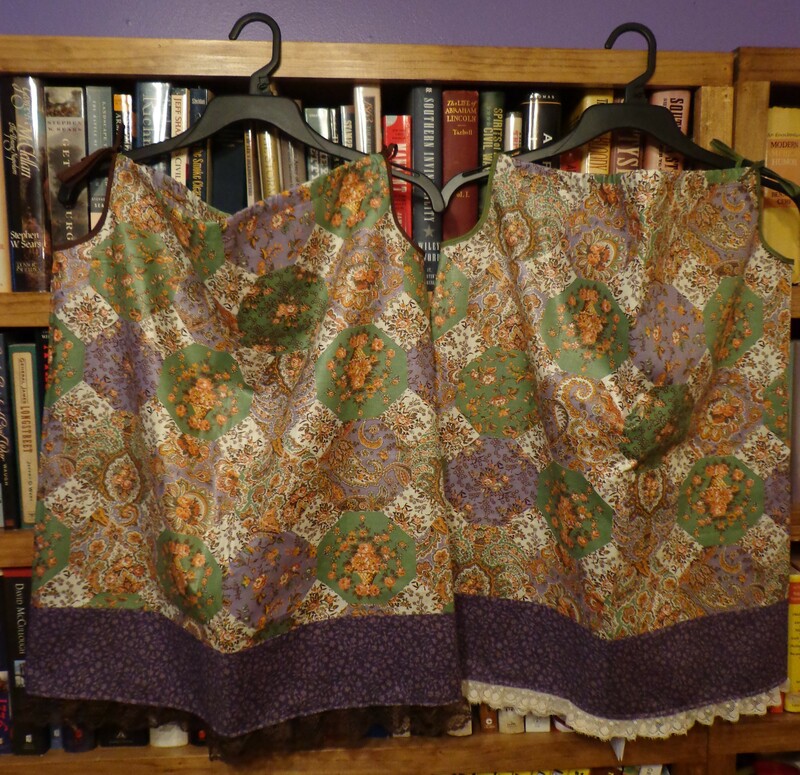 The dress on the right has an olive green trim and ties, and then a thicker knit lace on the bottom. 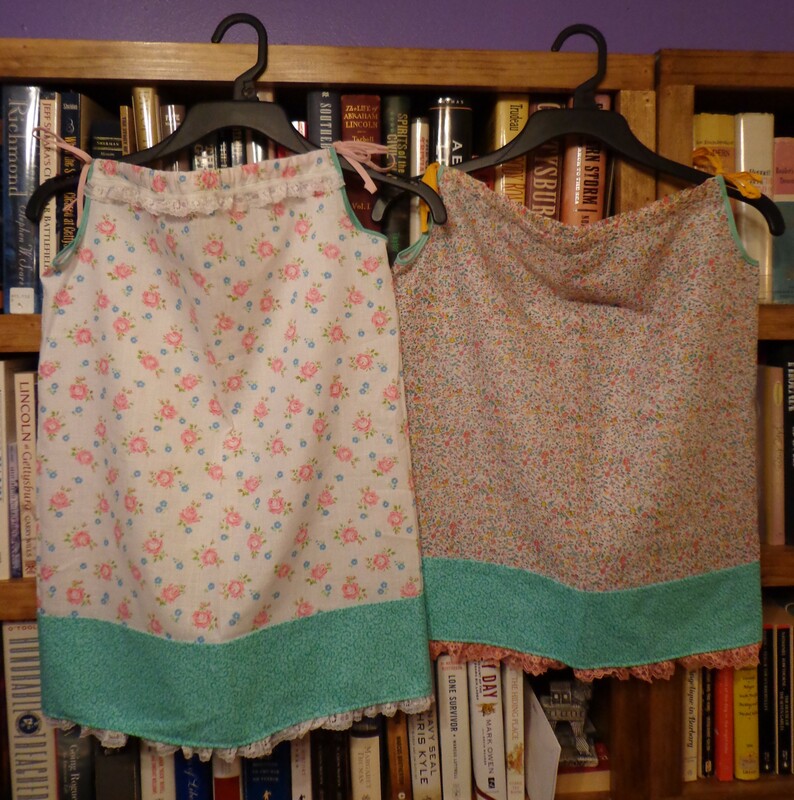 The dress on the left had the darling roses on it so I didn’t want to detract from those, however, I DID have to add the extra lace on the top. It just called for it. The dress on the right allowed me to use some lace that I had received in a lace grab bag that I thought I would never use. Where would I ever use peach colored lace??! Right here! First off, it was darling. 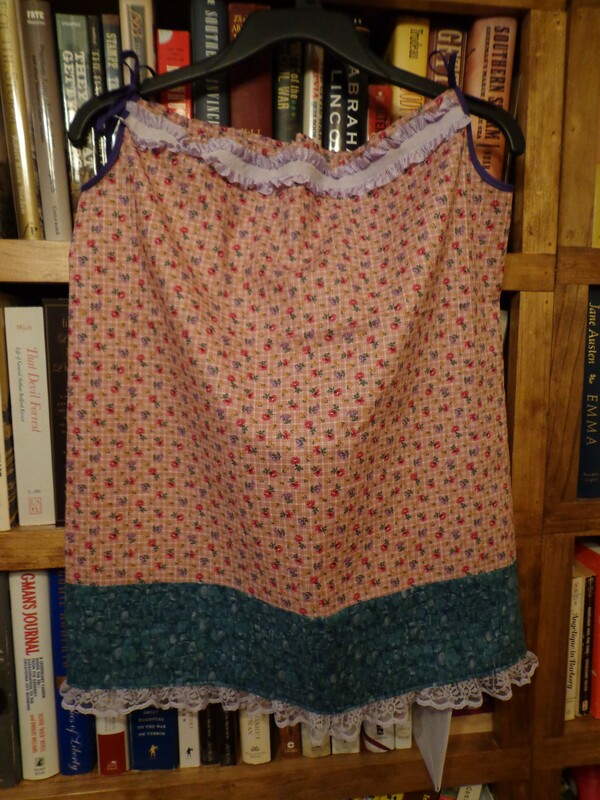 Secondly, it matches the light lavender lace that I used on the hem. The blue material at the bottom has a light lavender color running through it, plus there are a lot of dark purple flowers on the main body of the dress. Oh, and the main body has a checkered kind of pattern running through the background, as does the ribbon. It’s lacey and it’s purple. Some little girl is going to love it! So that’s what I’ve been doing this week. And I loved every minute of it! There’s something soothing and relaxing about sewing. I love starting with pieces of material and ending up with an actual dress. I just wish that I could see the look on the girls’ faces when they are handed their lace-trimmed dress. 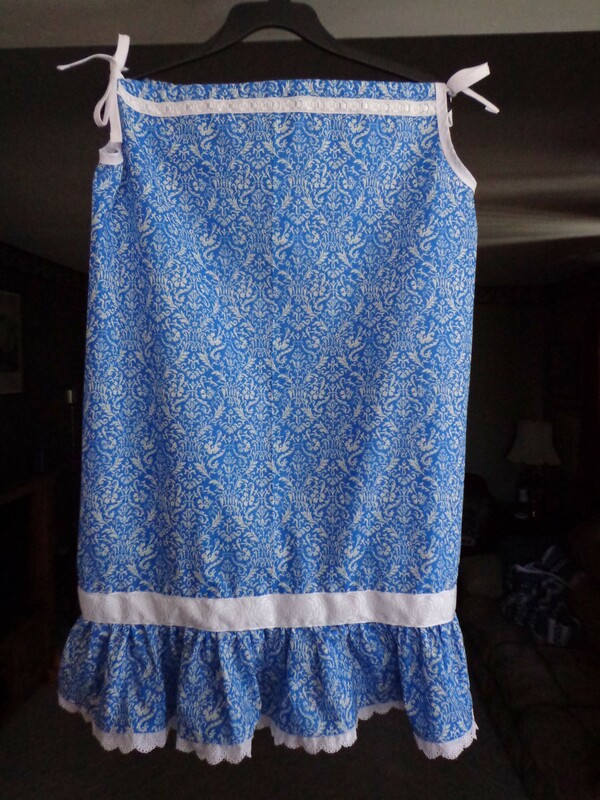 This entry was posted in Dresses for Missions, Faith, Sewing and tagged Dresses for Missions, Faith, Sewing. Bookmark the permalink.